In the a record breaking year with 400 entries, Patricia Howard of Winter Springs, Florida has been named the Grand Prize winner of the 2006 National Gingerbread House Competition at The Grove Park Inn Resort & Spa in Asheville, N.C. A field of eight judges deliberated for more than four hours on Monday night to determine the winners among three categories: Adult, Teen 13-17 and Youth 12 and under. More than 600 spectators watched the judging process in the resort’s Heritage Ballroom. Suzanne Smith from Mulberry, Florida won first-place in the adult division. Other first-place winners included Megan McBath, Kayla Tulloch and Marissa Summit from Greenback, Tennessee in the Teen 13-17 year old age group and Julie Navin from St. Charles, Illinois in the Youth 12 and under category. There were a total of 149 Youth, 73 Teen and 178 Adult entries in the 14th Annual National Gingerbread House Competition. The previous record was set in 2004 with 325 entries. As always, judging the creative creations was difficult and the proof was in the judge’s final tallies. Howard won the grand prize by a mere two points in a close battle for the coveted grand prize. In fact, the judges were forced to break ties in the top ten round. “I’m speechless,” said Howard who titled her house “A Woodland Winter.” “It is the first time I have ever made a gingerbread house!” Howard’s creative three story octagon-shaped contained some interesting features such as tortilla shingles stained with brown food coloring and gingerbread planks stained with a light and dark wood grain design and . “It was an example of perfection exhibiting incredible textural detail.” Said Judge Nicholas Lodge, owner of the International Sugar Arts Collection School in Atlanta, Georgia. As the Grand Prize winner, she wins $1,500, plus a Reconnect Package which includes two nights' accommodations on our Club Floor, dinner for two in our AAA four diamond award winning Horizons Restaurant and dinner for two on our Wine Spectator Award winning Sunset Terrace. 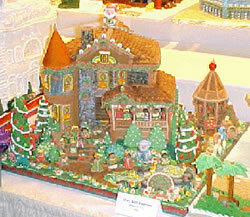 The 2006 National Gingerbread House Competition display and holiday decorations will be open for community viewing Monday through Thursday from November 20, 2006 through January 6, 2007. Overnight Resort guests as well as those dining in our restaurants or enjoying our lounges are invited to view the displays at any time. A change from previous years, The Grove Park Inn is partnering with downtown Asheville’s historic Grove Arcade to display the entries. Forty houses were selected by Grove Park Inn’s Visual Arts Manger Joe Hughes. The Grove Arcade, one of Asheville’s architectural jewels, was envisioned by E.W. Grove, the creator of the Grove Park Inn. 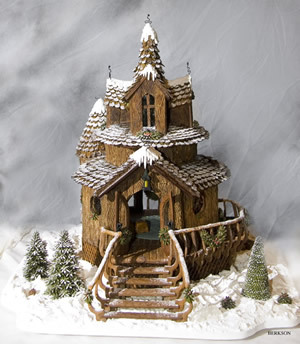 Also new this year, Executive Pastry Chef Aaron Morgan has selected an honorary mention house to be displayed at the Asheville Chamber of Commerce throughout the holiday season. The honor is bestowed to Lisa Kragel of Marshville, North Carolina. Howard’s winning entry and selected other winners will be removed from The Grove Park Inn display during the week of December 18 as the resort transports them to New York City for its ninth straight appearance on ABC’s “Good Morning America” on Friday, December 22.
of the displays is located throughout the Resort. The youth, teen and adult top ten winners will be located on the lobby levels of the Sammons and Vanderbilt wings. Eight judges had the very tough job of determining this year’s winning entries including Chef Aaron Morgan, The Grove Park Inn’s Executive Pastry Chef; Chef Nick Lodge (Atlanta, GA), founder, The International Sugar Art Collection; Nadine Orenstein (New York), curator Department of Arts and Drawings, Metropolitan Museum of Art; Chef Steven Stellingwerf (Sioux Falls, SD), author of "The Gingerbread Book;" Chef Frances Burnett (Charlotte, NC), Chief Instructor, Johnson & Wales University; Gerry Hempel-Davis (Richmond, VA), travel writer; Chef Colette Peters (New York), owner of Colette’s Cakes and Chef Scott Leibfried (San Diego, CA), host of Food Network’s “Challenge” show; Jill Cordes (New York), host of “Best Of” on Food Network, “My First Place” on HGTV and “petstyle.com” served as master of ceremonies. It’s not too late to get started for next year’s competition. The 15th annual event is set for Monday, November 12, 2007. For more information visit www.groveparkinn.com.